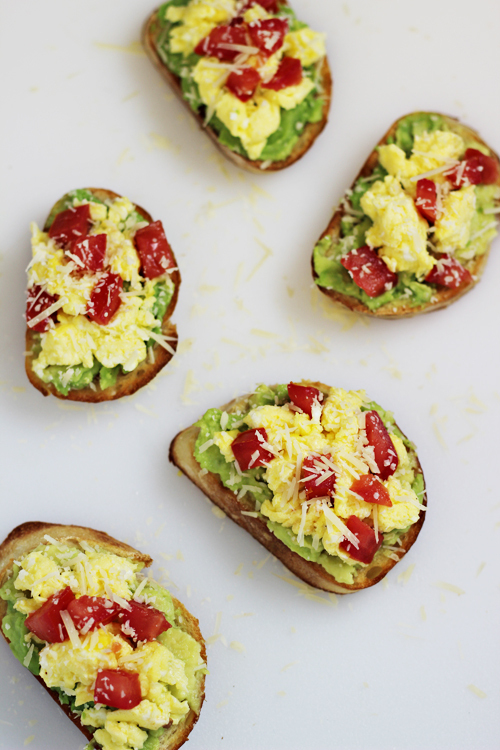 This Egg and Avocado Breakfast Crostini recipe is my happy morning secret. Well, that and a cup of coffee or two. I have quite a few foods that I love to eat and I don’t think I’d ever get tired of. I could do a post of all the things I want to devour on a daily basis, but one that is at the top of my list is eggs….but more specifically, eggs with avocado. YES. Both make me happy, but together….a little bit of heaven. Even though I don’t get tired of eggs and avocado, I still don’t eat them exactly the same way every time. Sometimes I have them as a breakfast burrito or other times it’s a poached egg and avocado on sourdough bread. I have fun trying new ways and luckily David is always a happy recipient of my creations. 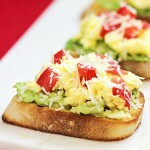 Even if you don’t share my exact enthusiasm for eggs and avocado, I think you’ll like my breakfast crostini recipe. 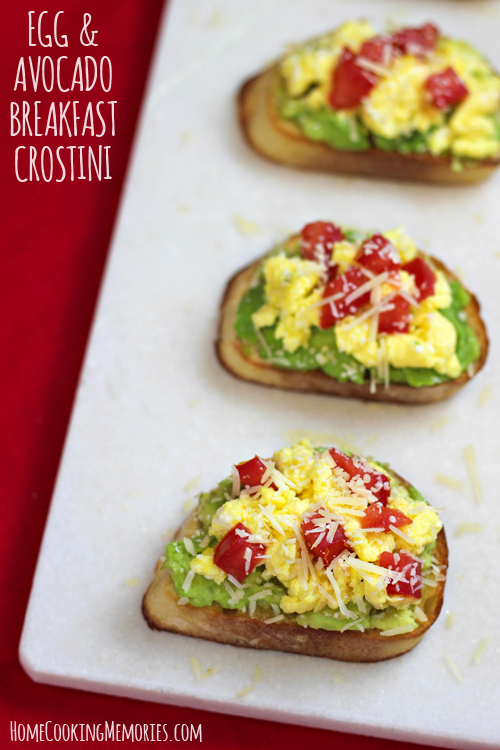 It feels like a fancy breakfast and you can even say the word “crostini” all fancy-like. As you can probably guess, making these Egg & Avocado Breakfast Crostini are pretty easy. Just take a baguette and cut it into slices. The slices are placed on a lightly greased baking sheet and the tops of each one is brushed with a bit of olive oil. You’ll bake them in the oven until browned and toasty. While those little bread slices are in the oven, that’s when you are going to mash up an avocado in a bowl. I season with a bit of salt and pepper and a little lemon juice. It would also be good with a bit of chopped cilantro or jalapeno, but I usually skip all that and go nice and simple with this. You’ll also make up some scrambled eggs. 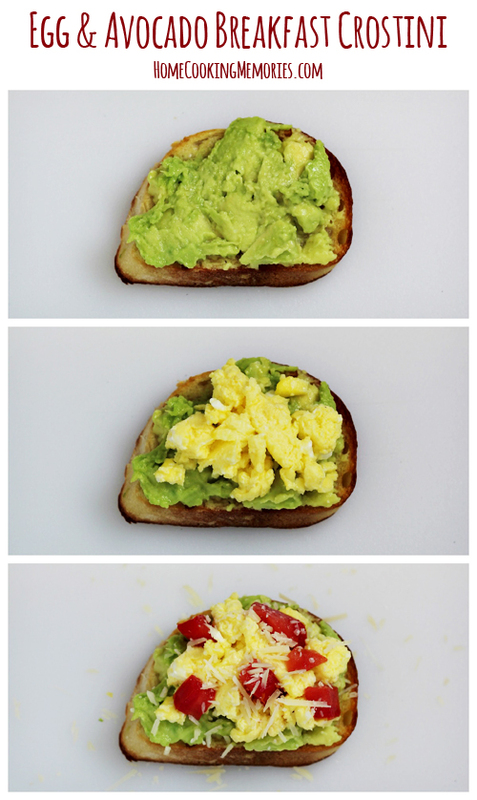 To assemble, you’ll take one toasted bread slice and top it with some of the mashed up avocado. Then, top with a bit of scrambled eggs, a few diced tomatoes and a light sprinkle of Parmesan cheese. Just writing this up makes me want these for breakfast tomorrow, but, of course, I’m out of ALL of the ingredients. But fear not, it will be in my near future. Lightly grease a baking sheet. Preheat oven to 350 degrees F. Slice baguette into approximately 14-16 slices. 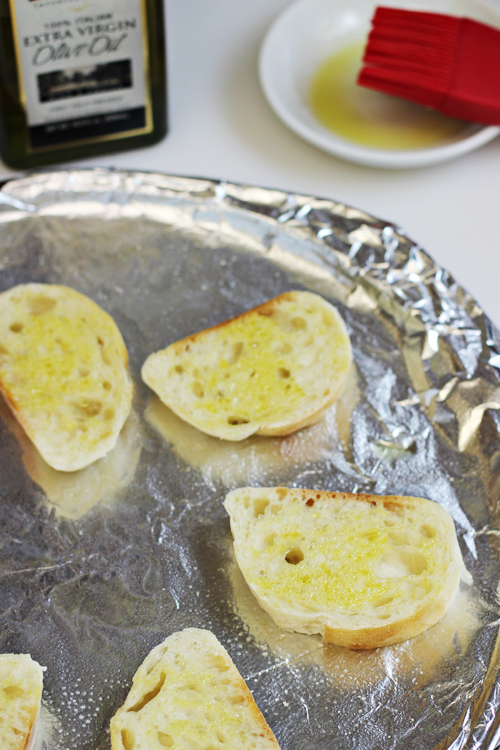 Lay slices on baking sheet and brush tops with olive oil. Bake for about 5 minutes or until lightly browned and toasted. In a small bowl, beat eggs and milk (or water, if using that instead), until blended. Heat a small skillet over low-medium heat and melt butter, allowing it to coat bottom of pan. Pour egg mixture into skillet. As eggs start to cook, push, pull, and fold eggs with a spatula frequently until all egg is cooked and no liquid remains. Remove from heat. Season with salt and pepper, if desired. In another small bowl, mash together avocado, lemon juice, and salt. 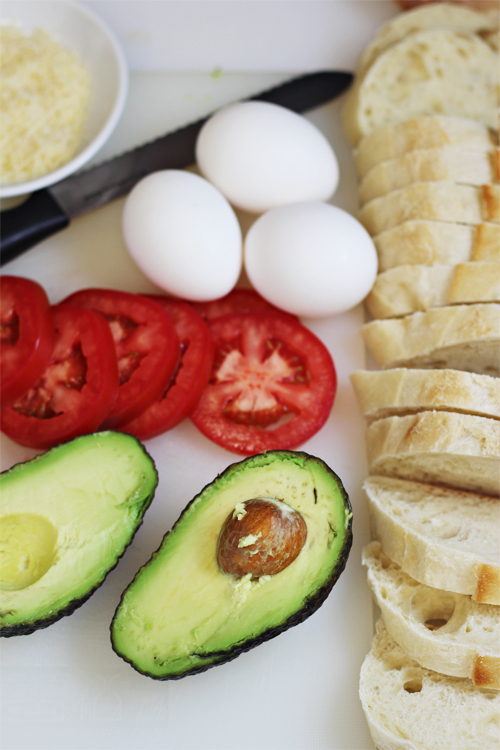 Divide avocado among bread slices and spread on each slice so most of the top of the bread surface is covered. 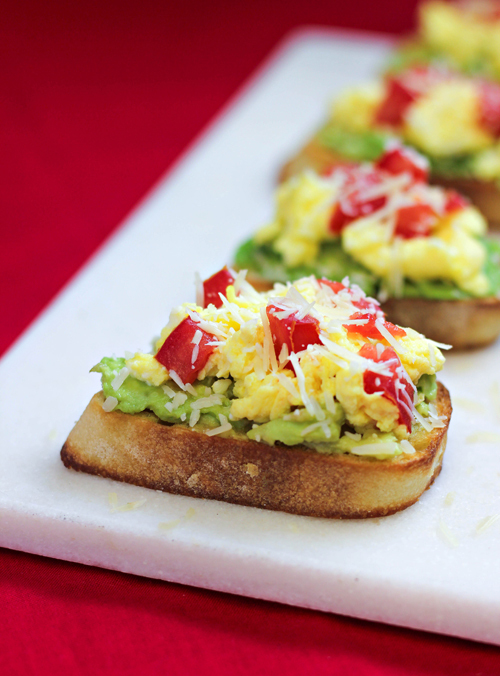 Divide scrambled eggs among bread slices. Top with chopped tomatoes and sprinkle with shredded Parmesan cheese. This looks like the perfect breakfast choice for me! I am not a sweet eater – prefer the salty and savory meals myself! I could never be tired of this. Thanks for such a beautiful post. I’m an egg fanatic too and this sounds right up my alley! I could eat that for breakfast every day! Delicious! What a healthy, scrumptious meal! I love these 🙂 I could never tire of avocado either. Do you have any idea of portion size or calorie count for that portion size.